Perfectha® is the latest-generation of Hyaluronic Acid cross-linked with the E-brid technology to fill wrinkles, augment tissue volume and lip contour. For natural and long lasting results. Perfectha® is a hyaluronic acid based dermal filler that restores volume and fullness to the skin to correct moderate to severe facial wrinkles and folds, such as nasolabial folds, cheeks and lip volume. Your skin can be plumped to look beautifully health and your facial volume will be restored. Perfectha provides optimal results with low injection volume. Perfectha is easy to inject due to excellent flow properties.Perfectha has a hydrating effect. Regaining beauty with a natural look. Perfectha® is the latest generation of hyaluronic acid filler for natural and long lasting results.As we become older, our bodies break down this acid and our skin loses its vitality and elasticity. -Perfectha Fine Lines: 20 mg/ml, 180000 gel particules/ml. For fine lines and superficial wrinkles. -Perfectha Derm: 20 mg / ml, 90 000 particules/ml. -Perfectha Deep 20 mg/ml, 8,000 particules de gel/ml. -Perfectha Subskin 20 mg/ml, gel 2000 particules/ml. Formulated for large losses of volume including augmenting the jaw, the chin and the cheeks as well as rejuvenation of the hands. -Perfectha Complement 20 mg/ml, 180000 gel particules/ml. Formulated for a retouch after botulinum toxin or peeling procedures. 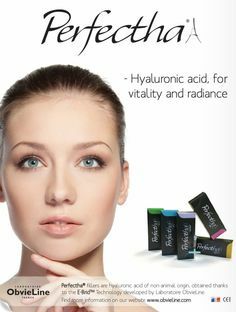 All PERFECTHA by SINCLAIR are on France-health, the on-line parapharmacy specialized in aesthetic medicine , mesotherapy and care: all dermal filler brands, hyaluronic acid injections, cosmetic facial filler, medical devices, pre and post injections, cannulas, thread lift , accessory, beauty care and anti-aging products. PERFECTHA There are 16 products.